AMERICAN RENAISSANCE « THE BRYCE IS RIGHT! – It is no longer business as usual. There is something in the wind. America is changing, not just a little, but a lot. No, it is not the political intrigue of Washington featuring numerous investigations. Nor is it the recent spat of sexual harassment charges, or Russia for that matter. These are all manufactured distractions by the Main Stream Media (MSM). A new way of thinking about government is starting to permeate society, and frankly it is long overdue, and it is making the Washington establishment nervous. During 2017, we witnessed the rise of the American economy. The Labor Department reported unemployment is down to 4.1%; the Department of Agriculture reported the number of people on food stamps is beginning to decline; the Bureau of Economic Analysis reported the Gross Domestic Product grew throughout the year and looks to accelerate presuming the tax cuts pass; and the stock market is hitting record highs. The President has also issued numerous orders to cut bureaucratic red tape, thereby freeing up business to prosper and grow. Yet, most Americans are unaware of this as it goes unreported by the MSM. In terms of immigration, the Department of Homeland Security reported dramatic reductions in illegal immigrants in 2017, and the southern wall is in the offing. Again, the MSM overlooks such changes. The President also signed Pro-Law Enforcement and Anti-Crime Executive Orders. In addition, he is very supportive of rebuilding the military. His no-nonsense approach to trade and statesmanship has been noticed by both our friends and enemies abroad. Donald Trump was elected president not because he was a noted politician, but for being a hard-nosed businessman who is able to get things done. His super Type-A personality is despised by the Washington establishment, on both sides of the aisle. As is typical of someone with his stature in business, he uses some friendly bullying and humor to get his way, most of which is misunderstood by the media and his opponents. It is this type of defiant personality middle America finds appealing, and resented by politically correct politicians and the press. However, with the 2018 midterms on the horizon, and the clamor from the American public to get the economy working and to safeguard the country, the Republican side of the house is slowly waking up to the fact it is a new day in Washington, not “business as usual,” and they better get aboard the Trump train or pack their bags for home. This means an “American Renaissance” is in the offing, a reawakening of basic American principles, such as smaller government, individual liberty, respect for family values, and an acknowledgement that the American Dream is based on capitalism. Of course, this does not sit well with the Left who represents the polar opposite of such values and, as such, is fighting President Trump every step of the way. However, the Renaissance concept has already taken hold and is gaining traction. Should the economy continue to accelerate, and the president can deliver on his promises, there will be no stopping the renaissance. At the time of this writing, the proposed Tax Reform plan hasn’t yet fully passed the Congress. If it makes it to the President’s desk for his signature, this will be a significant catalyst to power the American economy even further, raising the GDP, encouraging business, and putting more money into the pockets of the people. A stimulated economy will then begin the process of paying off the national debt and shrinking the deficit. As an old systems man, I am acutely aware of the effects of change. The more dramatic the change, the more people tend to resist it. The problem though is Americans have grown accustomed to “business as usual” in the nation’s Capitol for so long, our government and country is denigrating in the process. The changes engineered by Mr. Trump were inevitable as the country no longer accepts the status quo of the Washington establishment which has floundered and produced nothing of substance, other than the enlargement of the government. Perhaps Mr. Trump’s biggest legacy from his term of office will be the realization it is time to think and act differently in government. This is something past presidents simply do not comprehend, nor his political opponents or the press. However, I’m betting by the time Mr. Trump’s tenure is over, he will make the changes implemented by Ronald Reagan seem minuscule. What is necessary is to recognize these are extraordinary times we live in, and the status quo simply won’t cut it any longer. 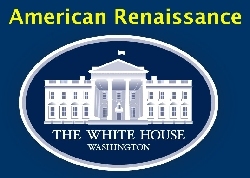 “American Renaissance” is the mantra we need to embrace to make America great again. NEXT UP: WHY DO OPPOSITES ATTRACT? – Good question and something that has puzzled us from time immemorial. LAST TIME: FLY FISHING IN WESTERN NORTH CAROLINA – Beware of hatchery fed trout.